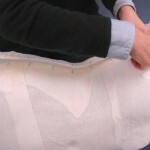 The pattern is marked onto gauze which temporarily covers the dressform. 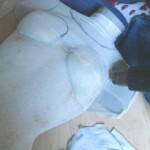 Then the KobraCast is shaped separately on the lower part and the breast part, using hot air and a wet rag. 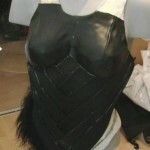 Artificial leather strips are glued on, with details in Worbla and faux fur. 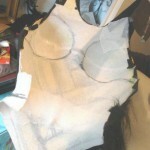 Making a custom tailor’s dressform for the Wuppertaler Theatre. 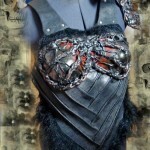 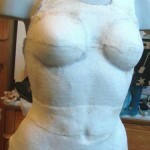 KobraCast breastplate shaped on a plaster body cast, lined with fabric for comfort.